As the Gooding and Company auction gets underway Friday morning it appeares as if the heat and humidity is sucking the life, and the will to spend money, out of the bidders. The first lot for sale, a 1912 Ford Model T Speedster, sells for just $22,000 (before the 10% buyers premium); barely 50% of its predicted low-end estimate of $40,000. Things can only get better, right? Not so. The next two lots sell either below their estimated price or at the low-end of the expected range. Up comes Lot #4. A 1973 Porsche 911 Carrera RS 2.7. Here's a car that has to sell. After all, there are 25 Porsches for sale in this auction (including 17 from the now famous Drendel Family Collection). This should be a decidedly Porsche crowd one would think. This particular Porsche is being sold with reserve (meaning it must meet a predetermined price known only to the owner and the auction house before it will sell). Auctioneer Charlie Ross gets the bidding started at $100k and with his usual charm quickly moves the crowd, and the bidding, north of $200,000. But then it simply stalls. At this point I don't know if it is something to do with this particular Porsche, the rising temperature in the tent, or if bidders are simply saving their money for the Drendel Porsches. Whatever the reason, this Porsche is passed (meaning it didn't meet the sellers reserve) with a high bid of $260,000 (well below the anticipated price range of $300,000 to $375,000). However, it does eventually sell later in the day for $275,000. Now I'm nervous. What does this mean for the Drendel family? Is there any relation? The next 10 lots come and go in similar fashion, they are either withdrawn (taken out of the auction before it even starts), passed or sold at what can only be considered relative bargains compared to their pocket guide estimates. In fact, a new friend of ours, and owner of a very special Porsche Carrera GTS, picks up a 1968 Shelby GT500 KR for $127,500 (over $30,000 less than the low estimate of the $160,000 to $200,000 range). Then lot #15 rolls onto the stage. Lot 15 is perhaps the most original Porsche 550 on the planet. We know this particular Porsche personally and can attest to its provenance and originality. So it is no surprise when the bidding starts at an even million for this most sought after of Porsches. What is surprising is how fast the bids grow. We are tweeting as fast as big thumbs on an iphone allow, but it's not fast enough. Our first tweet is at 11:57 mentioning the start of the auction. By 11:59 the price is climbing past $2.7MM and we can't tweet fast enough to keep up. Six minutes later and it looks like it's all over. The price settles at $3,100,000 and the hammer is coming down when another bidder jumps in on the phone*. The crowd is really into it now. There are three active bidders all vying for the 550 and it seems that no price is too high. The price continues to move up in small increments. The bidder on the phone obviously wants this Porsche and is willing to pay for it. He does. The hammer comes down for a final time at 12:09 pm marking a price of $3,350,000 (before the 10% buyer premium) and setting a new world record for a 550 and the first of many for the day. With the sale of the 550 complete the temperature doesn't seem quite as stifling. I'm not sure if this is due to Gooding and Company opening some side vents on the tent to let in a cross breeze or if the worry has left the room now that a record price is set. Either way, I'm not alone in this feeling. The next 30 lots blow by in a blur including a 1971 Ferrari 356 GTB/4 Daytona Spider selling for over $1,000,000 and a 1953 Fiat 8V that was at first passed but eventually brings $750,000. It seems the stage is set for the Drendel Family Collection. The first of 17 Porsches from the Drendel Collection arrives on the auction block in the form of an unassuming 1988 Porsche 944 Turbo S. Selling without reserve at an estimated price of $50,000 to $65,000 this first turbo hammers out at $80,000 ($88,000 with the buyers premium). The Drendel collection is off to a great start and things only get better from their. It's obvious this crowd is here to buy these Porsches. One by one the Drendel Collection come across the block and one by one they sell. When the dusts settles these 17 incredible Porsches bring in nearly $18,000,000 in total, achieve 9 of the 11 Porsche records set that day including a double world auction record for the the highest price paid for a Porsche at $4,400,000 for the 1973 917/30 Can-Am. 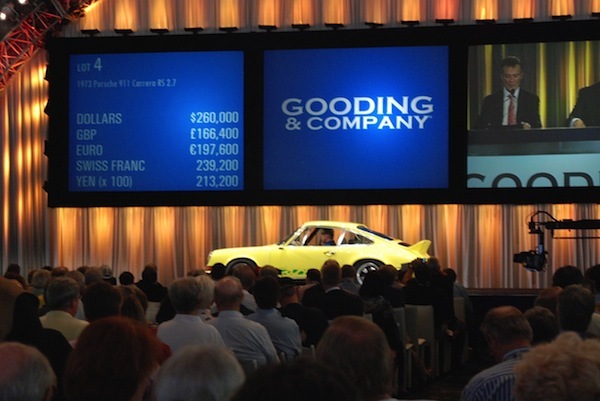 In fact, of the 70 cars sold by Gooding over the course of this auction, 25 of them are Porsches bringing in $23,388,200. That's means that only 36% of the cars sold accounted for more than 65% of the $36,057,800 in total sales. A very, very strong showing for Porsche. You can see the complete auction results here. We're starting to post pictures from the weekend on our Facebook Page. Some of them are pretty rough, but bear with us as we work through our photos. We took over 2000 pictures this weekend so we have lots to go through and will post more as we can. We have albums from the auction preview, the auction itself and many other things to come. If you haven't done so already, please be sure to "like" our page while you're there. *What many don't know is that just a few short minutes ago the winning phone bidder for the Porsche 550 was part of the crowd and sitting in the first three rows of bidders. When it looks like things are going to heat up, he quietly slips out the side and places his bids via phone in order to avoid the media and attention these high prices are creating. Fortunately for us, the bidder is a close friend of FlatSixes.com and we'll be talking with him later this week to learn what we can about his bidding strategy, the new owner and plans for this particular Porsche. Thanks for posting this. It’s about time that Porsches receive the collector price notoriety and high values in the collector world that other, less raceworthy brands have. Porsche has done it not so much from scarcity, but rather, from racing achievements as well.